Martin will not attend Athletics' spring training as he is recovering from right meniscus surgery, Jane Lee of MLB.com reports. Martin underwent offseason knee surgery after appearing in 109 games between High-A Stockton and Double-A Midland last season. 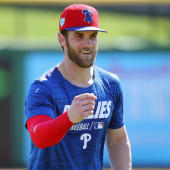 Though he won't be able to attend big-league spring training this year, he is expected to be back to full strength by mid-March and should be ready for the start of the regular season. The young shortstop will likely open the year in Double-A, where he slashed .224/.306/.315 in 2017.